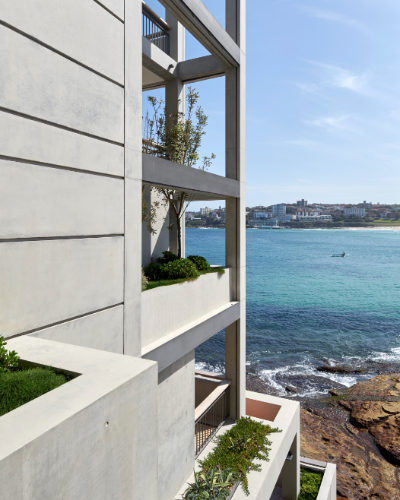 Concrete has been used with artistic flair to create a sculptural dream home in North Bondi, Sydney. 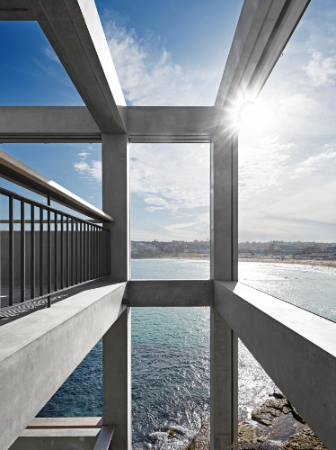 Deepwater House by architecture practice Tobias Partners is located right by the ocean and offers spectacular views of Bondi Beach. "The design shows off the beauty of off-form concrete in a soft home abode,” says founding principal Nick Tobias. Nick says he set out to make a building that was 'very quiet from the outside', utilising concrete to create balance with the natural seascape and neighbouring urban environment. Situated at the high tide level of the Pacific Ocean, the site presents an aggressive, abrasive and corrosive environment. Concrete was selected as the primary building material for its robustness and durability, and the ease with which it can be used to create beautiful architectural forms. The building spans five storeys, with three above the front street access and two leading down to the high tide mark. An intriguing feature of the building is the “wave return” at its base on the seaward side, a defence against the elements. 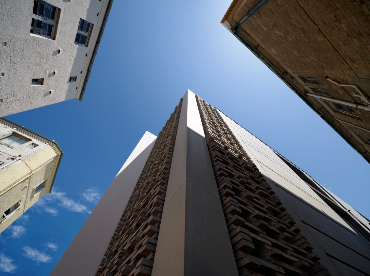 The building is founded on Sydney sandstone, which, along with the home’s concrete construction, supports its future in the challenging environment. Oceanfront balconies with a void space have been used to capture the magnificent views. Expressed concrete beams and columns form the matrix of a showcase facade, giving the building strength and character. The site presented difficult construction challenges – the restricted battle-axe block has a narrow street frontage and there is a steep slope in the underlying sandstone. The fact that concrete can easily be pumped as a liquid, from the kerbside of the street to its final in-situ location, made it an ideal material for the project. Constructing iconic buildings can be challenging, but with innovation and attention to detail Project Principal John Richards and Bellevarde Constructions built a beautiful project. This is evident in moves such as concealing the wall ties in joint recesses, which has made them invisible to the observer and contributes to the monolithic appearance of the concrete facades. John Richards took a revolutionary approach by creating drip ridges, rather than drip grooves, to keep concrete facades looking fresh and sharp. The approach to constructing formwork was more like cabinet carpentry, producing fine, detailed formwork and breathtaking concrete walls and soffits. The builders constructed trial prototype concrete walls in the internal basement areas of the house, to prove and test the innovations in formwork and finishes before proceeding to the visible external walls. This has resulted in quality concrete walls and soffits that are a joy to experience. 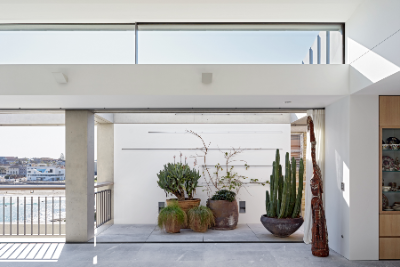 Concrete versatility enabled it to build the foundations, columns, beams, floors and roof of Deepwater House, as well as an opaque balustrade that provides privacy for the balconies. The material also provides passive climate control by absorbing and retaining heat to regulate a comfortable internal environment. 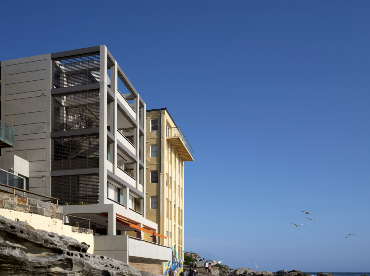 Building close to the ocean demands a strong, durable building material – concrete provides that strength and durability while also having the ability to “flow” and form sculptured structures. Tobias Partners skilful use of concrete has created a permanent and beautiful sculptural home by the sea, demonstrating that concrete as art is not just something to be admired from a distance. 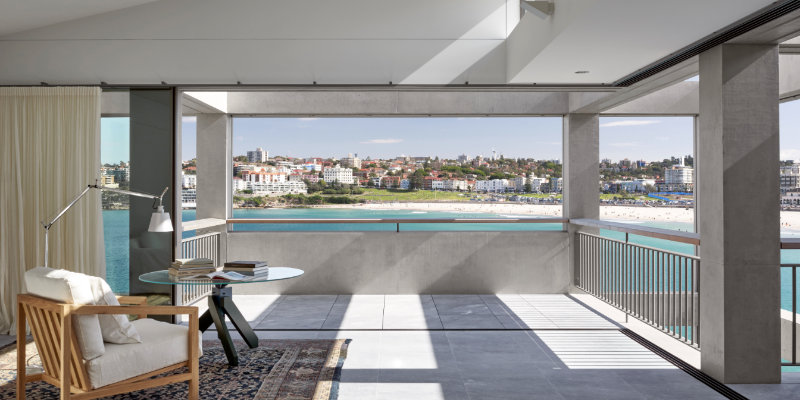 Concrete is ideal for building dream homes that last, not only at North Bondi but throughout Australia, across a variety of challenging environments.